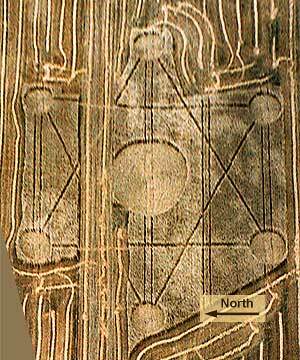 The six outer circles were connected by paths that formed a six-pointed star. Arrows show the direction that plants were laid. Many thanks to Gordon Sopczak of Edmonton for his assistance in taking these measurements. It took us about two hours. Happily, it was a beautiful day to be out in the fields. Thanks also to Jeff Challoner of Red Deer for providing the aerial photo in this report. This photo has been distorted in Photoshop to approximate as closely as possible the actual measured proportions of the formation. This is based on the original photo by Jeff Challoner of Red Deer.